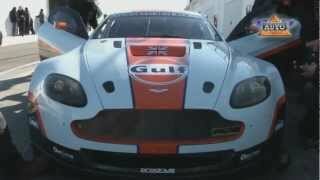 Aston Martin Vantage GTE 2012 is a developmenet of the Vantage GT2, with significant improvements to all areas including the engine, drivetrain and suspension. Carrying the iconic Gulf colours, the new car will make its competitive debut at round one of the FIA World Endurance Championship, the 60th anniversary edition of the 12 Hours of Sebring, on March 17th. The driver line-up has been confirmed as Darren Turner (GBR), Stefan Mücke (D) and Adrian Fernandez (MX). 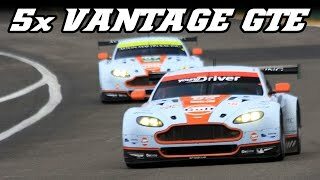 At the heart of the Vantage GTE is the road-going Aston Martin V8 Vantage. The GTE is a significantly updated version of the original GT2 car and has been specifically designed to compete in championships running to the Automobile Club De L’Ouest GTE regulations. Under the bonnet, the engine is based on the standard Aston Martin V8, but with competition components including cylinder heads, connecting rods, valves, camshafts and a racing exhaust system. As in the road car, the transmission is mid-rear mounted, but with a six-speed semi-automatic sequential transmission and competition clutch. The transmission also has a dedicated oil/air cooling system. Gaydon, 24 February 2012 – Aston Martin Racing will embark upon an exciting new challenge in 2012 as it prepares to make a return to international GT motorsport in the FIA World Endurance Championship. The team will campaign a V8-powered Vantage in the GTE Pro category of the eight round series, which spans three continents. At the third round of the championship, the 24 Hours of Le Mans, Aston Martin Racing will field a second works Vantage GTE. The Vantage GTE is a development of the Vantage GT2, with significant improvements to all areas including the engine, drivetrain and suspension. Carrying the iconic Gulf colours, the new car will make its competitive debut at round one of the FIA World Endurance Championship, the 60th anniversary edition of the 12 Hours of Sebring, on March 17th. The driver line-up has been confirmed as Darren Turner (GBR), Stefan Mücke (D) and Adrian Fernandez (MX). Aston Martin Lagonda Chairman David Richards shared his enthusiasm for the new project: “It’s great to be returning to our core motorsport activity; production-based GT racing. It formed the basis for Aston Martin’s return to competition when the DBR9 GT1-racer was launched in 2004, and it was in GT racing that we achieved our famous victories at Le Mans in 2007 and 2008. In order to give the team more competitive experience of the Vantage GTE ahead of Le Mans, Aston Martin Racing will also contest the Long Beach and Laguna Seca rounds of the American Le Mans Series on April 14th and May 12th respectively. At the heart of the Vantage GTE is the road-going Aston Martin V8 Vantage.The GTE is a significantly updated version of the original GT2 car and has been specifically designed to compete in championships running to the Automobile Club De L’Ouest GTE regulations. Under the bonnet, the engine is based on the standard Aston Martin V8, but with competition components including cylinder heads, connecting rods, valves, camshafts and a racing exhaust system. As in the road car, the transmission is mid-rear mounted, but with a six-speed semi-automatic sequential transmission and competition clutch. The transmission also has a dedicated oil/air cooling system. The bonded aluminium structure is taken directly from the V8 Vantage road car. Into this, Aston Martin Racing integrates an aerospace specification steel roll cage built to FIA standards. With the exception of the roof, the bodywork is manufactured from lightweight carbon fibre and features an advanced aerodynamic package with carbon fibre splitter, flat floor and diffuser, and a carbon fibre rear wing designed using the latest computational fluid dynamics (CFD) techniques.The Vantage GTE retains the road car’s double wishbone suspension layout at the front and rear, but with bespoke wishbones and coil springs over Koni adjustable aluminium bodied dampers. Powerful but lightweight six-piston Brembo racing calipers are fitted to the front axle with similar four-piston calipers at the rear. 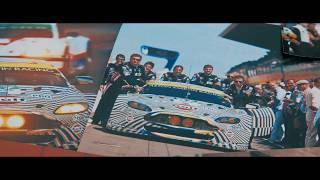 Aston Martin Racing’s decision to enter the FIA World Endurance Championship will ensure that the brand continues to compete at the very highest level of endurance sports car racing. As of the 2012 season, all of Aston Martin Racing’s competition cars are based on the road-going Vantage, reflecting its status as the sportiest car in Aston Martin’s model range. Adrian Fernandez added: "GT racing will be a new experience for me because I have raced single-seaters and prototypes for the majority of my career. It's always a pleasure to try something new as a racing driver and with Aston Martin's past success in the GT category, I'm sure I will learn how to get the most out of the Vantage GTE very quickly. We have a strong driver line-up with my team-mates Stefan and Darren, who have a lot of experience in GT racing. I am excited for the start of the season as well as the opportunity to represent Lowe's both in a world championship and the American Le Mans Series." Aside from a two-car campaign at the 24 Hours of Le Mans, Aston Martin will also host the inaugural Aston Martin Racing Festival, which gives all owners of its GT competition cars the opportunity to participate in an exclusive 45-minute race on the 8.5-mile Circuit de la Sarthe on the morning of the 24-hour epic.